The Tarrant SBDC not only reaches entrepreneurs just entering the small business community, but continues to build long-term relationships with existing clients. The mission of the Tarrant SBDC is to help businesses through all phases of their life cycle; i.e. pre-venture, start-up and growth. While some clients only use the Tarrant SBDC services during one phase of their business, others, such as Technology Team, LLC, have availed themselves of the Tarrant SBDC counseling, training, and partnerships through the life of their company. Technology Team came to the Tarrant SBDC in February 2003, looking for help on NAICS codes. The Tarrant SBDC team worked with Technology Team President, Sherry Green, in finding the right classification code for their new industry. Technology Team, LLC provides relocation experts for mission critical equipment, and was a pioneer in this market segment. Robin continued working with Sherry in providing marketing research on direct competition, used by Sherry in develop a marketing strategy. 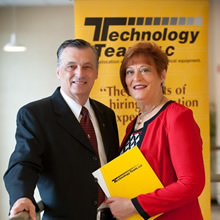 Technology team members, such as Sherry, and Vice President Allen Spinner, took advantage of our training options, and attended classes including the IRS Small Business Tax Workshop, HR For Small Business and Legal Forum. According to Sherry, the most helpful and informative of all the classes was FastTrac Growth Venture, which was well worth her time and effort in attending. FastTrac Growth Venture is an extensive, ten week program to educate new business owners on topics such as business and marketing plans, branding and incorporation. It is always rewarding to watch a business grow from a concept to a viable business enterprise, and to know we were able to help make that dream a reality.